Atrophic gastritis, intestinal metaplasia, and epithelial dysplasia of the stomach are common and are associated with an increased risk for gastric cancer. In the absence of guidelines, there is wide disparity in the management of patients with these premalignant conditions. 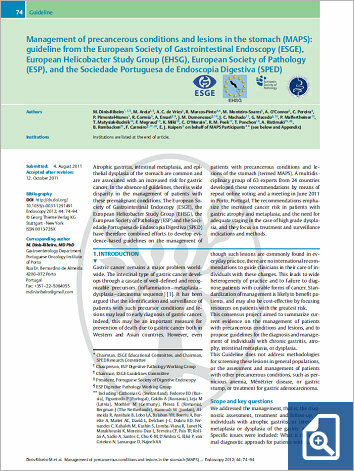 The European Society of Gastrointestinal Endoscopy (ESGE), the European Helicobacter Study Group (EHSG), the European Society of Pathology (ESP) and the Sociedade Portuguesa de Endoscopia Digestiva (SPED) have therefore combined efforts to develop evidence- based guidelines on the management of patients with precancerous conditions and lesions of the stomach (termed MAPS). A multidisciplinary group of 63 experts from 24 countries developed these recommendations by means of repeat online voting and a meeting in June 2011 in Porto, Portugal. The recommendations emphasize the increased cancer risk in patients with gastric atrophy and metaplasia, and the need for adequate staging in the case of high grade dysplasia, and they focus on treatment and surveillance indications and methods.